Dr Hammond brings to the CRC a wealth of experience having been a working scientist and as a director at a range of innovative research and development organisations in Australia and New Zealand. He will take up the position on 13 August 2013, and will retain his role as Chairman of the CRC for Mining, a position he has held since 2007. He is also currently Chair of the Australian Government’s Commercialisation Australia Board and a member of the Innovation Australia Board. With a research background in marine ecology over 18 years, Dr Hammond moved from academe to industry to take a lead role in the commercialisation of several technology ventures. In addition, a significant part of his working life has been as an investment manager. He has also had a 20 year involvement in funding programs and policy development for national and regional research and innovation bodies. The Bushfire Cooperative Research Centre welcomes the Australian Government announcement (13 February 2013) to create an expanded national centre for research into bushfires and natural hazards. This CRC will build on the 10 years of national research of the Bushfire CRC and expand research into other hazards including flood, earthquake, cyclone and tsunami. The process to achieve that is now underway. It is led by former AFAC CEO and Bushfire CRC Director, Naomi Brown who took on the role of Interim Chair, assisted part-time by Bushfire CRC Deputy CEO and Research Director Dr Richard Thornton, as Interim CEO. 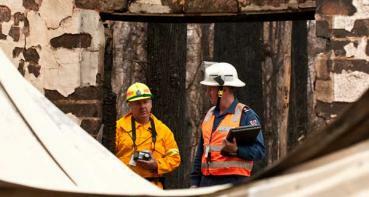 Richard retains his role at the Bushfire CRC while working to establish the new CRC. Mr Gary Morgan, chief executive officer of the Bushfire CRC said that with funding for the Bushfire CRC scheduled to end in June 2013, this announcement was timely and with a long term vision. “The creation of the first national centre for combined research into fire and natural hazards is a welcome development by the Australian Government. “The knowledge and expertise that has been built up over the last decade in national bushfire research can now continue and be expanded into related areas involving other natural hazards. “Current bushfire research projects including communicating warnings, community education and resilience, incident management, severe weather, urban planning, ecology and biodiversity, and emergency worker safety, have the potential to be extended across other natural hazards. In addition, there are new areas of research that will be opened up under this broader research centre. “The continuation of research in fire and natural hazards will meet the operational needs of fire and land management agencies across Australia and New Zealand. Communities prone to natural hazard events will continue to benefit from the new science that is being applied to reduce the impacts of these threats. The decision to fund a new CRC followed almost two years of briefings and discussion by the Bushfire CRC Chairman and Board members, the CEO, and individual heads of member agencies and their staff.